Interior decorating is indeed an art form. And when you're staring at a blank hardwood floor canvas, rugs can be your best friend. Of course, though, you can't just go throwing any shaggy rug and hallway runner wherever you please. Like an artist, you must be strategic with your rug choice and placement. Colors, designs, and sizes all need to complement each other, helping to bring a room--and perhaps your entire house--together. So, with that in mind, there are few things you should consider before buying a rug. Below, you'll find some basic decorating advice for area rugs. When you're deciding on a size, make sure you leave enough room around the borders of the rug. A rug that sits to closely to furniture or the wall loses some of its appeal. As a general rule of thumb, try to allow 3 feet between the edge of the rug and any walls or and furniture. If the rug is going beneath a dining room table, though, make sure it extends at least 2 feet from the edge of the table. This way the chairs surrounding the table will rest evenly on the rug. Also, if you plan to use two different rugs in the same room, make sure they're different sizes. If not, it will make the room simply look like it's split in half. Rugs are great for defining spaces, so let them do what they do best. The color of your rug should be a contrast to the room's current colors. This will allow the rug to balance the lighting and hues of the room. When working with colors, remember that darker colors bring warmth and filler to a space while bright and neutral colors create a more spacious and clean feel. Your rug's pattern should subtly match the other patterns in the room. Of course, it shouldn't be an exact match, but you want to avoid mixing design elements--horizontal and vertical lines, traditional décor with modern design, etc. 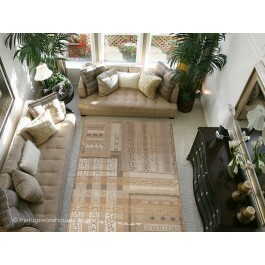 Also, if you intend for your rug to be the focal point of the room, the design itself should have a focal point. Most traditional and oriental rugs feature prevalent designs that flow from the center of the rug.